I was bored the other day and was itching to open up some packs. I am still looking for Donruss. For some reason the Walmart near me does not seem to be getting it in. That's unfortunate. If anyone has any versions of the Brock Holt Highlights card, I really want that one. 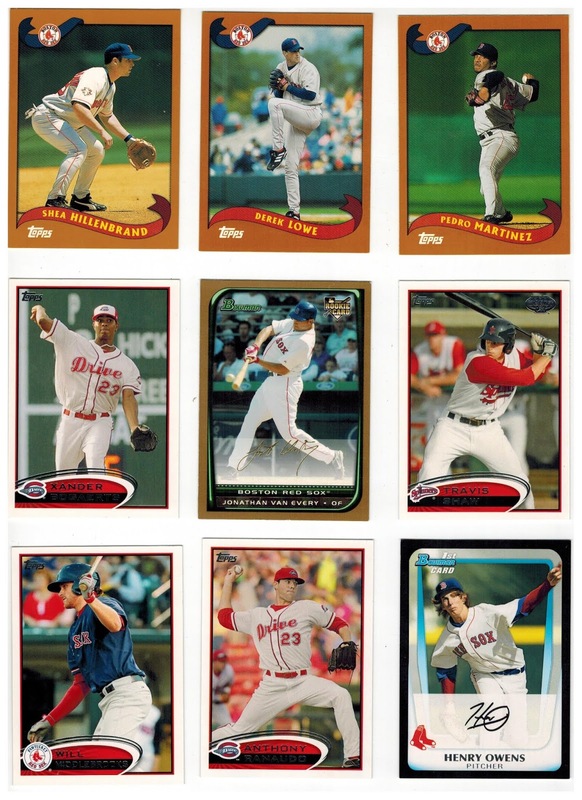 Now, I am not a big collector of the mascot cards or ballpark cards. I keep them in my collection when I get them, but I do not go out of my way to get them. 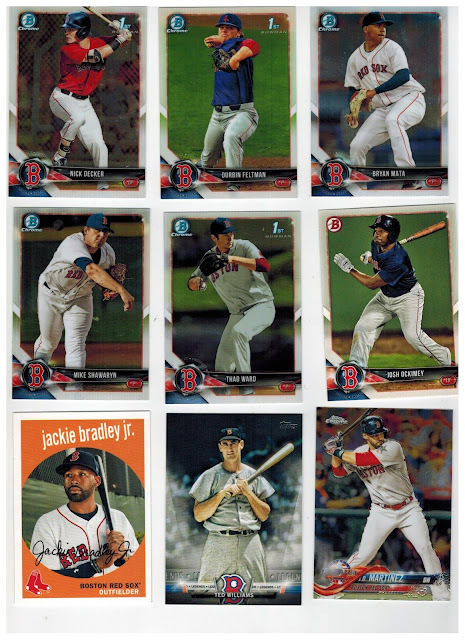 Porcello was the only base card I received. I really like this Pedro Martinez insert showing him hoisting the 2004 World Championship trophy. 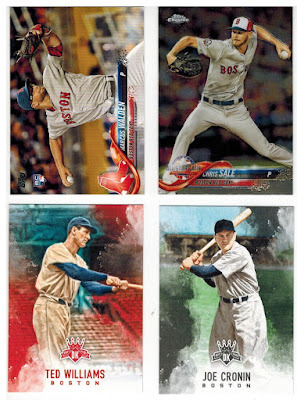 Once again, three (actually four but one was a double) Red Sox cards. It included this cool insert of Yaz and Mookie Betts. It also included a World Series Highlight card of Steve Pearce and a League Leaders card with J.D. Martinez on it. I have been pretty lucky with packs this year. This is the third auto or relic I have pulled and I really have not been buying much. And they have all been pretty good too. An Albert Pujols relic, the Bud Selig rare auto that I recently traded, and now this. 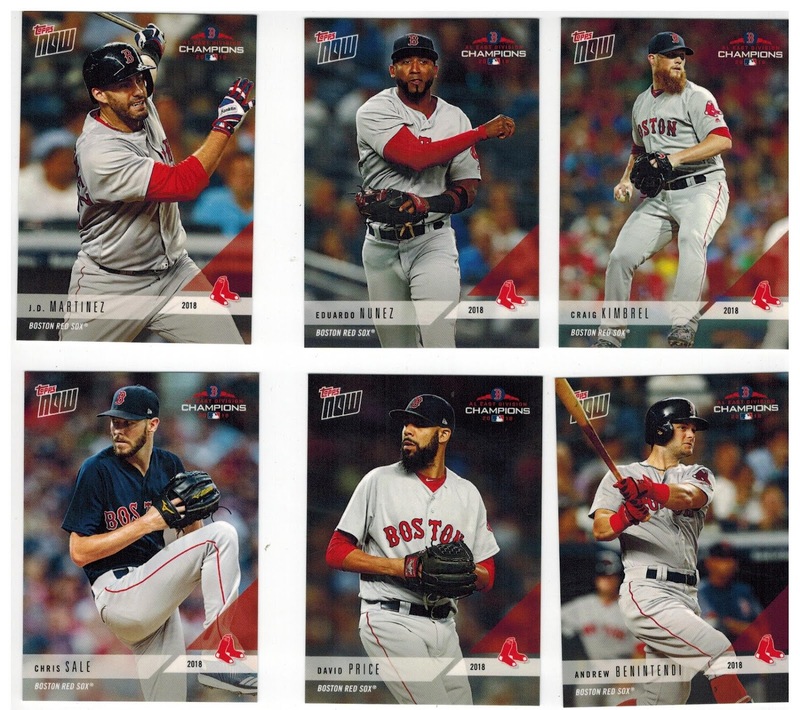 Once again, I am holding out for something decent for my Red Sox collection, but it is available. The Red Sox came out on top for the second time in a row. That is nice to see after having so many struggles with Topps Series 1. With two straight strong showings, the Red Sox have vaulted their way into third place. The Braves are just insane this year. The Padres will likely make up ground once Manny Machado cards find their way into packs. I always seem to pull a bunch of cards of him. As promised, this is the monster. 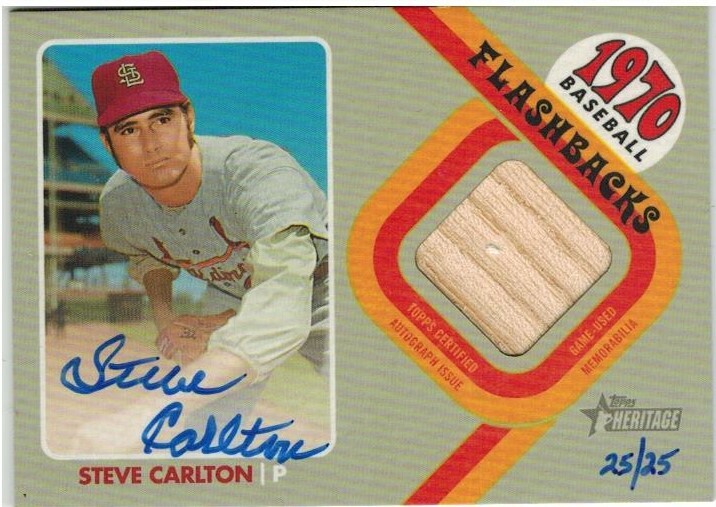 I traded my Bud Selig autograph I pulled from Heritage awhile ago for all of the cards yesterday and this one. 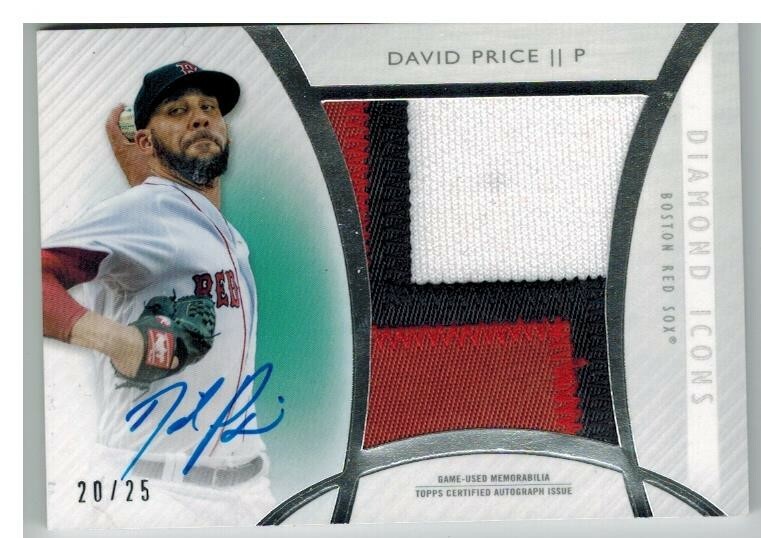 This is an amazing autographed patch card of David Price, who I still think should have been the World Series MVP last season. Price made me a huge fan with his postseason performance. I love this card. Here we have Part 1 of a two-part trade. The monster is coming in Part 2 tomorrow. 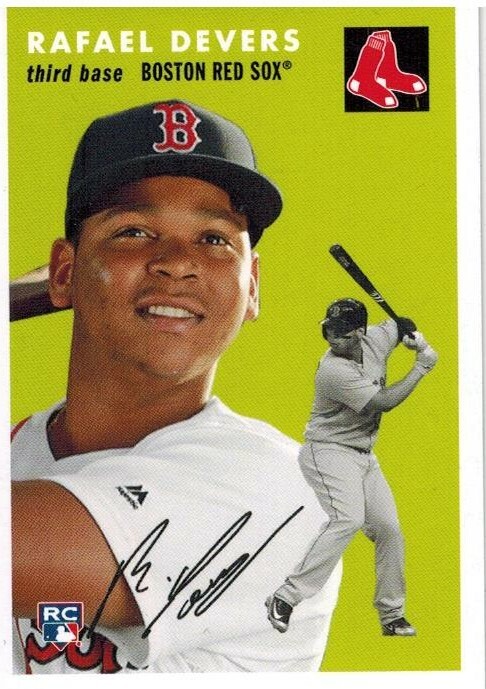 Part 1 is a whole bunch of wantlist hits, including a bunch of prospects, at least some of whom may never end up playing for the Red Sox. 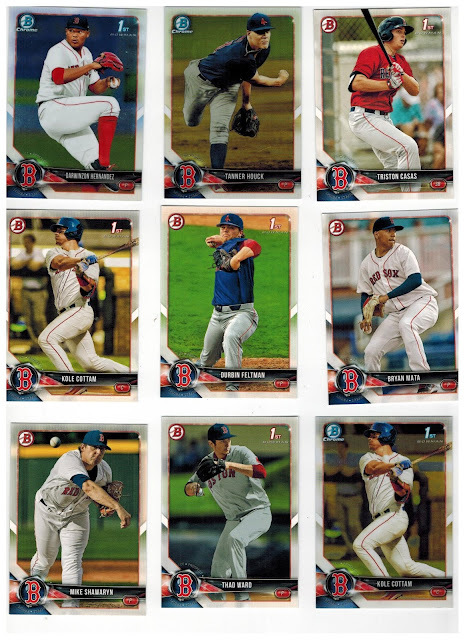 Of particular note in this scan is three of the Red Sox' top five prospects. I expect Michael Chavis to be called up to Boston at some point during the season. Bobby Dalbec is probably another year away with the possibility of getting the call late in the season. Jay Groome needs to start showing some results after being a potential #1 overall pick a few years back. Here we have a number of pitching prospects who could make appearances in Boston at some point during the season, including Darwinzon Hernandez, Tanner Houck, Durbin Feltman, Bryan Mata and Mike Shawaryn. Triston Casas was Boston's first-round pick last year. And here we have Josh Ockimey and some other prospects. We also have a Hall of Famer and a couple of current stars. This is one of those Throwback Thursday cards. 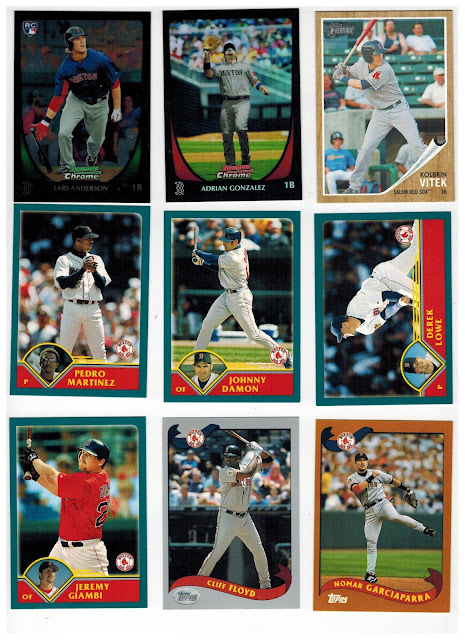 It is always nice to find someone trading these because you have to buy them from Topps in sets of five and they cost $20 each. This is a 1954 Topps design with hopeful 2019 breakout Rafael Devers. I have done four autograph team sets for Topps Now. The first two times, I received Chris Sale autos, which I am happy about, but I would have liked someone else the second time through. Then I got a Brock Holt auto from the World Championship set. 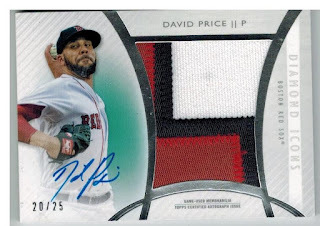 This set had three auto possibilities: Sale, Andrew Benintendi and David Price. Honestly, I wanted Price. 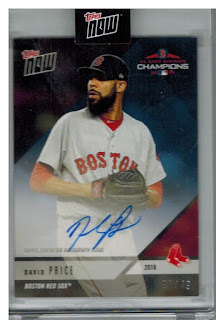 Yep, my first David Price auto. Though not my last. Wait until you see something coming in the next few days. I am thrilled with this card. Price was electrifying later in the postseason last year. I hope he keeps it up this season. No real huge surprises with the player selection there. 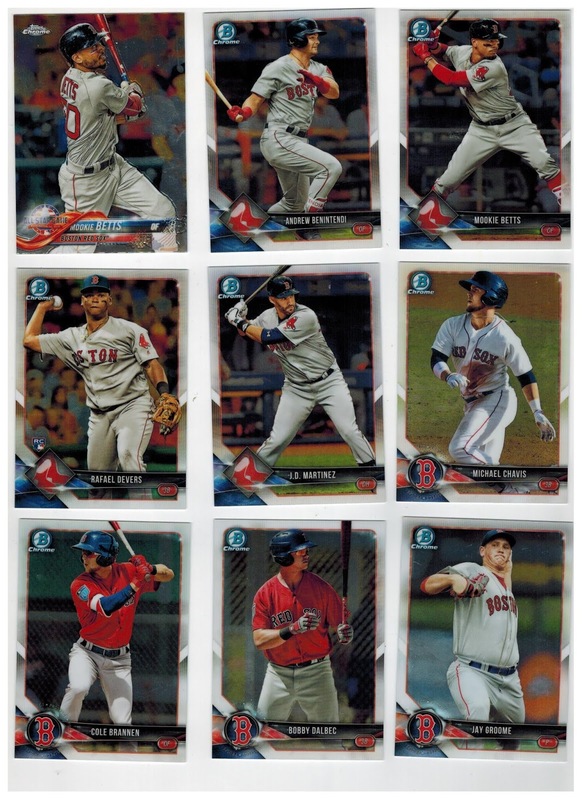 Brock Holt and Ian Kinsler are mildly surprising, though I am thrilled both were there. Kinsler will go down as a one-year wonder and Holt is a big fan favorite. And here are the rest. 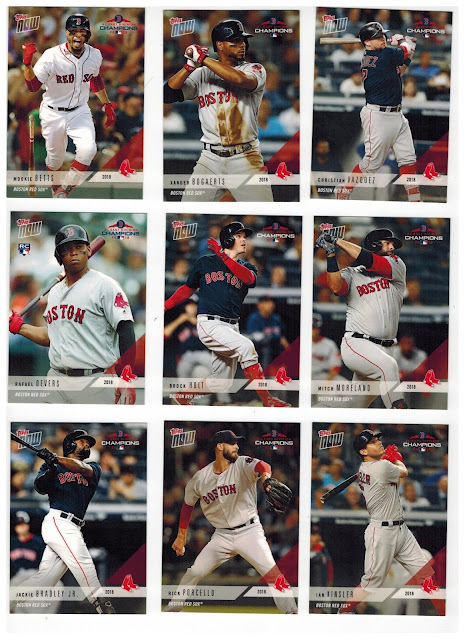 I am a little surprised at Nunez being there. 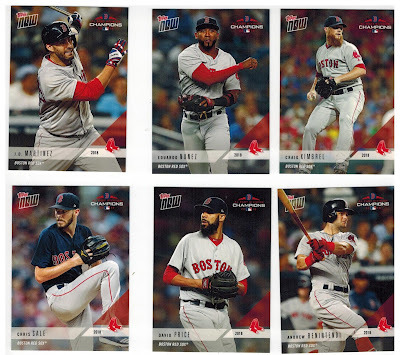 I feel it may have made a little more sense to get a bullpen guy or two in the set. Someone like Matt Barnes, or even better, Ryan Brasier would have been welcome additions. I'm just glad the set finally arrived. In the midst of the big flooding I received a package from the great Kenny, the Zippy-Zapper himself. This one was full of a bunch of new stuff for me, including a few wantlist hits. Just a terrific package. 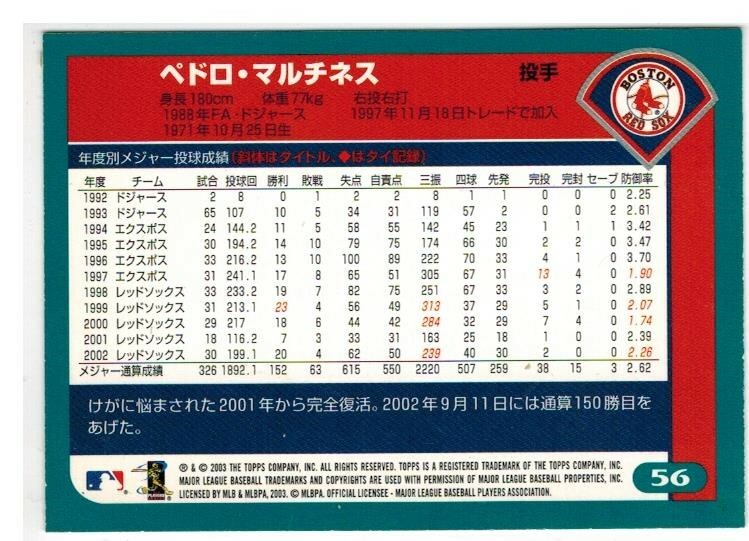 Yes, all of the rest of the cards, and the first three in the next scan, are Topps cards from Japan. 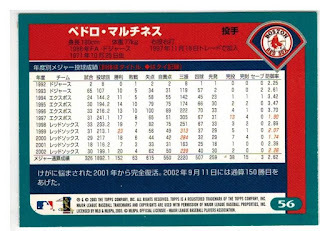 Specifically listed as Kanebo cards. I think these are my first Kanebo cards in my Red Sox collection. That is what makes the Zippy Zappings so great is finding stuff like that in them that can only be found in Japan. Here are the rest of the cards. Among the highlights are minor league cards of Xander Bogaerts, Travis Shaw (who has turned into a nice player for the Brewers), Will Middlebrooks and Anthony Ranaudo. And then there is Henry Owens who has washed out as well. Thanks a lot for the package Kenny!